Oakland will have to wait until Green Bay's season comes to an end. 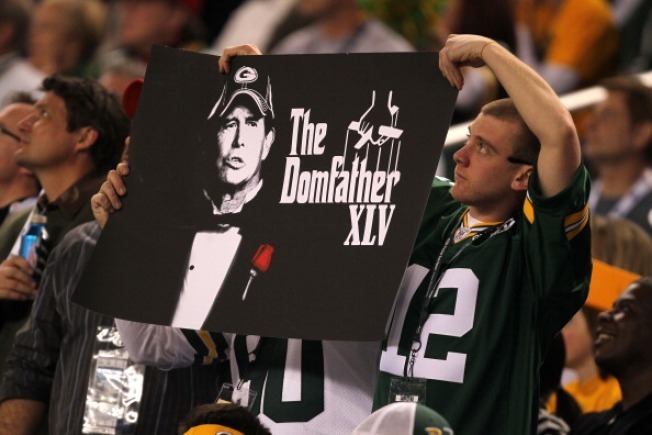 A Green Bay Packers holds up a sign for defensive coordinator Dom Capers during Super Bowl XLV at Cowboys Stadium. If you believe the rumors, nobody may be rooting harder against the Green Bay Packers than the Oakland Raiders. The Raiders are reportedly interested in speaking with Packers' defensive coordinator Dom Capers for its open head coaching position. Capers has been a head coach before but for the past several years has been in charge of a Green Bay defense that has been known for its wild blitzing schemes. That style led to a Super Bowl championship last year. And now the Raiders are reportedly interested in furthering its Green Bay connection, according to the NFL Network's Jason La Canfora. Earlier this week, the Raiders hired former Green Bay scout Reggie McKenzie as its new general manager. On the same day the team announced the firing of head coach Hue Jackson. The Raiders are not able to speak with Capers until Green Bay's season comes to an end.